Tissot Visodate - An Absolute Dress Watch Bargain! We said it many times already, being a watch enthusiast is not about money or having lots of it, it is about watches. Tissot is positioned as the entry level [luxury] watch brand of the Swatch Group and we thought it would be nice to pick one and have a closer look. 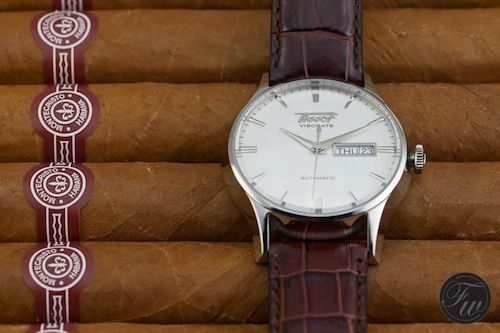 In cooperation with The Watch Hut – UK’s largest watch website – we picked this Tissot Heritage Visodate Automatic timepiece from their stock to review it here on Fratellowatches. This watch, a classic round shaped timepiece with a leather strap and an automatic winding movement has a price tag of 385 GBP (approx. 480 Euro / 620 USD). The Watch Hut was kind enough to send us a model to try & wear and it didn’t take that long to form an opinion on this 385 GBP Tissot Visodate. Obviously, the strap isn’t genuine alligator but ‘just’ has this alligator pattern or grain. However, that’s about the only thing we have to put down here on the right side of our imaginary pros and cons table. 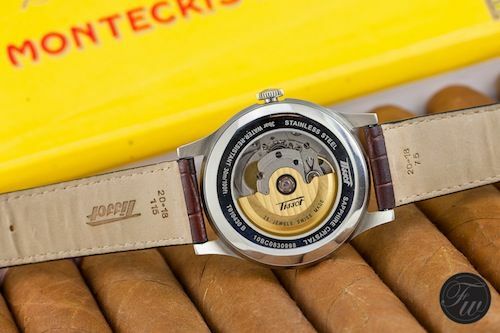 Tissot sourced an ETA 2836-2 movement from their mothership Swatch Group and has therefor a slight advantage on many of the watches out there in the same price category with either quartz movements or cheaper mechanical movements. Not that we say you won’t find a decent mechanical watch at all for that kind of money. 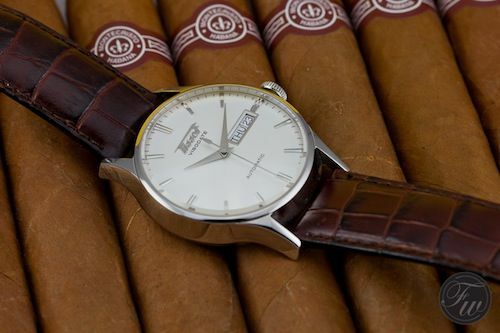 Furthermore, the stainless steel case has a diameter of 40mm which is perfect for most men (and women these days). Although we wouldn’t have mind that Tissot added a plastic crystal on this watch, being all heritage and 1950s and all, there is a scratch resistant sapphire crystal on top of this Visodate. Perhaps even better, as a plastic crystal would scratch quite easily and that looks a bit silly on a dress watch. The dial – and entire appearance of the watch – reminds us indeed of those 1950s, most probably because of the clean dial with its vintage looking applied Tissot logo, dauphin hands and arrow shaped hour markers. Very pretty! This watch is capable of showing day and date, due to the use of the 2836-2 ETA movement. We would have settled for date only to keep the dial as clean as possible, but we just see this as a plus. Tissot seems to be aiming at a lot of different watch consumers with their famous T-Touch watches, T-Sport chronographs, this Heritage collection and some more collections in between. We defininately have a slight preference for this Heritage collection. 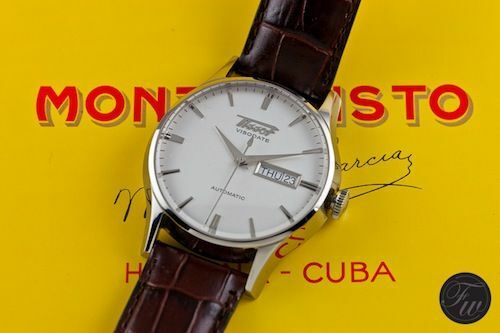 Perhaps because we love those vintage 1950s and 1960s watches of Tissot, Longines and Omega (now all Swatch Group), perhaps because this Visodate is just an example that Swiss watch companies can still make nice things for very little (relative, we know..) money. All in all, a nice watch for the young watch enthusiast, the collector with a budget or just as a gift to someone. The only thing we would change is the strap, just a black or brown calf strap would be perfect on this watch. Just don’t forget to exchange the Tissot (double) folding clasp to the new strap. Did we already mention this watch is just 385 GBP / 420 EUR / 620 USD? Oh, it does come with a two year warranty as well. p.s. The crown is indeed in time-setting mode on our photographs. Normally the crown is located perfectly next to the case.